Martin & Miriam arrived as scheduled on July 8th. Until their departure on 15th July we walked, shopped, pottered about in the garden, continued to get Mitzi in top class condition and had a couple of meals out.We even attended Franschoek's Bastille Day celebration where there was a procession and the main street and restaurants were bedecked in red, white and blue; red and blue French Berets abounded. We spent the last night with Martin & Miriam, John and Gilly Freeth and Joyce Scott at 'The Galley' in Fishoek; a restaurant right on the beach front serving great fish and prawn dishes. After Capetown.... It was difficult to tear ourselves away from the attractions of Capetown and its environs but Thursday 16th July saw us set off up the Garden route for our first stop at Wilderness Nature Reserve. It is definitely true that you only really get the best out of this route if you stop and spend time along the way. Wilderness is a small but very attractive and bustling holiday village set in a National Park; we had a good walk along the beach as the sun was setting. Back to town for a candlelight meal- RSA too suffers from occasional power cuts. As much of the Garden Route N2 road is away from the coast through rolling countryside and occasional wooded areas we decided to head for Addo Elephant National Park; you would think that after our Namibia/Botswana close elephant encounters we would have had enough. This was to prove correct. We arrived at the park only to find that it was absolutely fully booked and we couldn't even persuade them to find room for the smallest of tents. So we headed off up the N2 again. In Grahamstown we spent the night in jail - the Old Gaol Backpackers to be precise. A cosy little cell with just a simple double bed and chest of drawers. 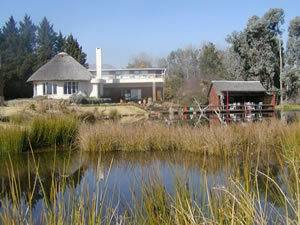 Grahamstown is an old established university town with wide tree-lined streets and beautiful old churches. To make up for our disappointment at not staying at Addo Elephant NP we treated ourselves to a lovely meal and then went to see the new Harry Potter film. A good end to the day. Nelson Mandela Day - brings us amazing luck! Still heading north on the N2 and still away from the coast we ended up in Kokstad, (East Griqualand). We found a small B & B then went off into town to look for somewhere to eat. 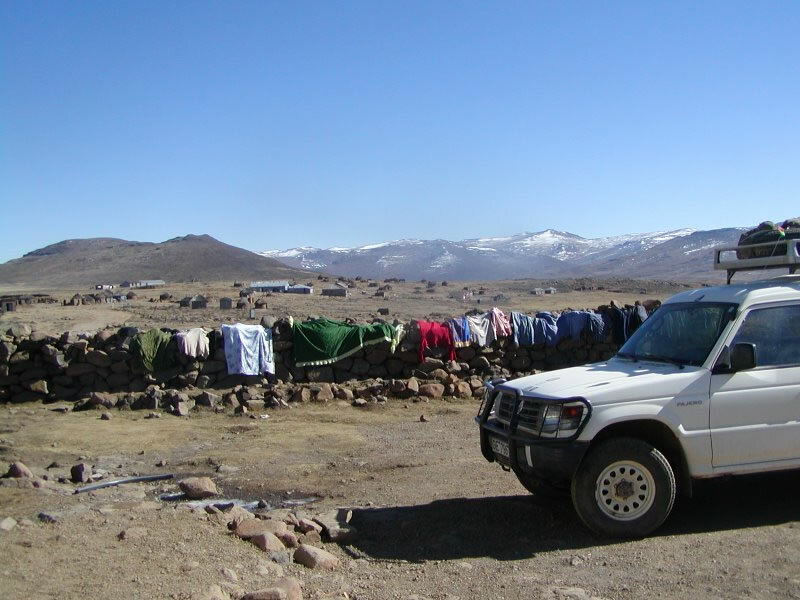 Whilst driving around town, we were flagged down by a couple in a vehicle who had noticed that we looked lost and immediately asked - had we found somewhere to stay and how about staying with them? We ended up having a meal in town with Chris and Phoebe Fey and arranging to met them next day to stay on their farm. We went to bed that night wondering if we had dreamt our meeting and the invitation offered!! This particular day (Sunday 19th July) was 'Nelson Mandela Day' when everyone was urged to give 67 minutes of their time to helping someone. Chris and Pheebs certainly invested more than 67 minutes on us! Thank so much. Chris met us the next morning and we followed him out to Fisherman's Bend - a dairy farm 10 kms SW of Kokstad with the most magnificent aproach and backdrop of mountains. We spent the next 24 hours being incredibly well fed and looked after by Chris and Pheebs, with a walk round the farm, afternoon tea with friends and a sundowner on the hills amongst the flowering Aloes. Truly spectacular. We really can't thank them enough for their hospitality. 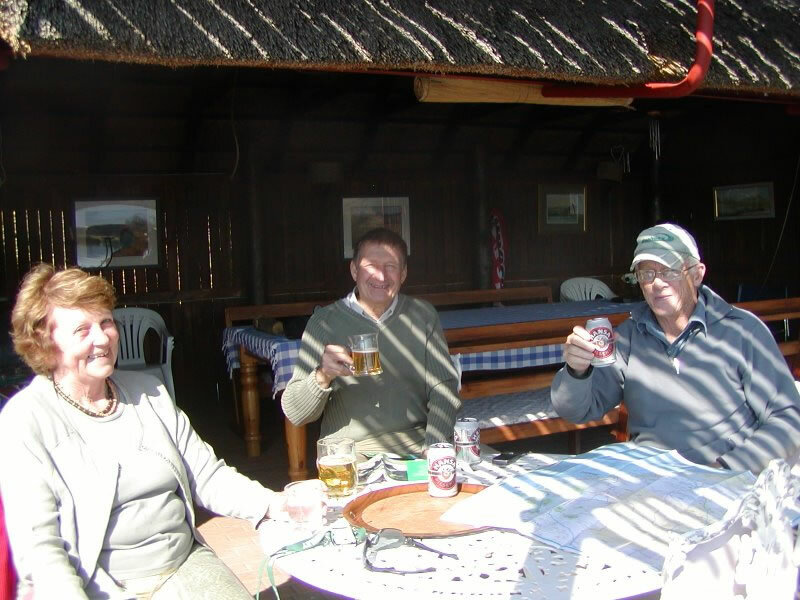 We headed off at 6.00am the following morning, via Underberg, to the top of the 'Sani Pass' in the Drakensberg, Lesotho, visiting the highest pub in Africa in the process. 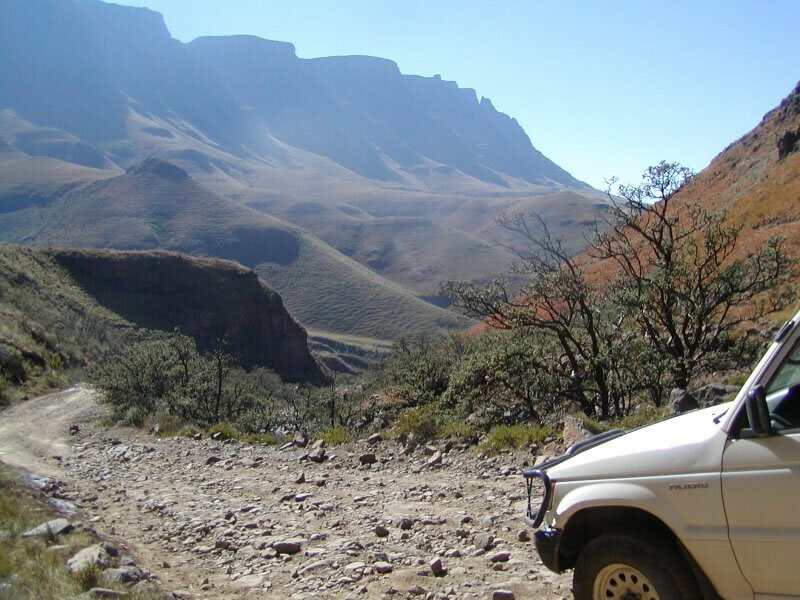 The drive up (and down) was very steep, rocky and spectacular; the last few hundred metres were really tricky and defeated several other vehicles. Incredibly, there was thick ice on a couple of the hairpin bends which were really tricky but that didn't defeat such an incredible team as Nigel and Mitzi. It even beat the Bissaula (Nigeria to Cameroun) drive for scariness! 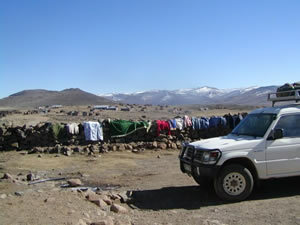 Having been stamped out of South Africa on the drive up, we were stamped into Lesotho at 2,873m / 9,425 ft. Pretty chilly. Back down the pass - just as hairy as going up- but brilliant! Two days later the mountains were covered in snow and a number of roads closed by snow; our timing was perfect. Lotheni Nature Reserve - snake encounter in the foothills of the South Drakensberg. We stayed at Lotheni in a self catering cottage with magnificent views of the mountains; we took a short walk on the first afternoon to Jacob's Ladder and then a long 10 km walk up to 7,500ft to 'Sheeba's Breasts'....well with a name like that we couldn't fail to check them out! We had a bit of a scary moment on the way up, when a metre long, silvery/grey snake (possibly a Green Adder) suddenly reared up on the path in front of Jenny; we stopped and stared at each other (snake and us) for about a minute before it slithered off into the undergrowth. Unfortunately it had slithered away before we had time to recover and get the camera out. After a picnic sitting on top of one of 'Sheba's Breasts' we set off back. At the end of the day, a lovely hot bath and supper in front of the log fire made for a very memorable stay. The one drawback of visiting this part of the Drakensberg in the winter months is that there is systematic but controlled burning of the grassland; thus our photos show some blackened hillsides; however, this burning promotes new grass and attracts the wildlife. A short distance from the camp, visible from our bedroom window, was a group of grazing Eland attracted by the new Restio shoots that were pushing through. Spring/Summer would be fantastic times to visit when the whole area would be green. We could have stayed much longer at Lotheni but time was ticking away. Back on the road again and heading for Durban we passed through Nottingham Road, a small village in the Midlands area with a strong leaning towards the Arts and Crafts - stopping for Coffee and Cake at Lulu's. Back on to the N3 , past Pietermaritzburg and the road goes steadily downhill, km after km until you hit the outskirts of Durban - a huge city with a skyline of skyscrapers. Durban - Anstey's Beach Backpackers at Bluff is just across the road from the beach but the water was still cold so I didn't try out my new swimming costume!! 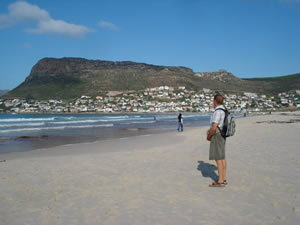 This is a real surfers' beach with plenty of waves crashing in; quiet during the day but busier once school and work finish. 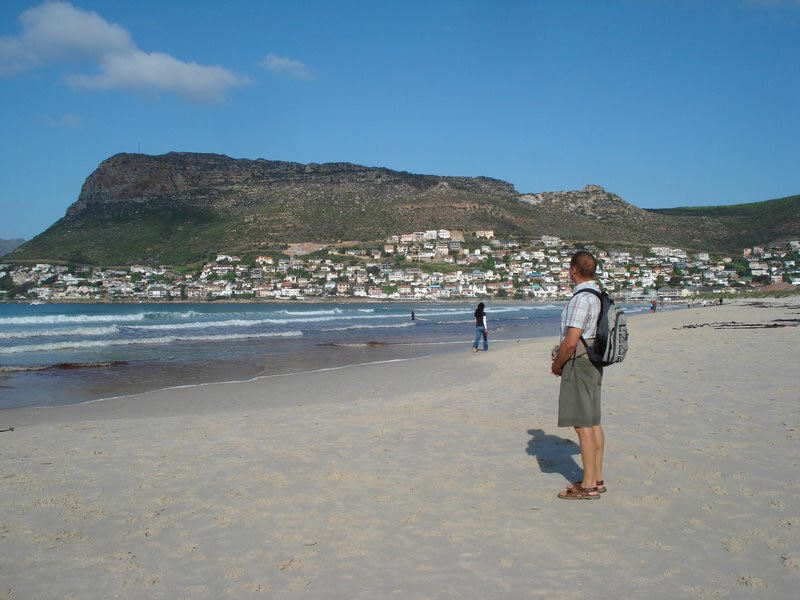 We found the Kwa Zulu Natal and National Parks Tourist Info office to get information on the next part of our journey to Swaziland and Kruger, then had a walk along the promenade by the sea. Durban seems to be full of building works - in preparation for the 2010 World Cup; there is a super new sports stadium near the seafront and lots of work being done to the road system and the promenade. Whilst at the Backpackers we were able to get Mitzi's oil and filters changed by two great mechanics, Gary and Ken, who were recommended by Ansteys. We then set off north through hundreds of kilometres of sugar cane and gum plantations (for paper making) - stopping en route for lunch at the sugar plantation Country Club in Kwa Mbonambi. The sugar plantations are huge in this part of SA and employ thousands of people as well as providing schools, accommodation and health care. Our next stop was Mkuse Game Reserve for a one night break in a self-catering safari tent, before proceeding to the Swaziland Border at Lavumisa. 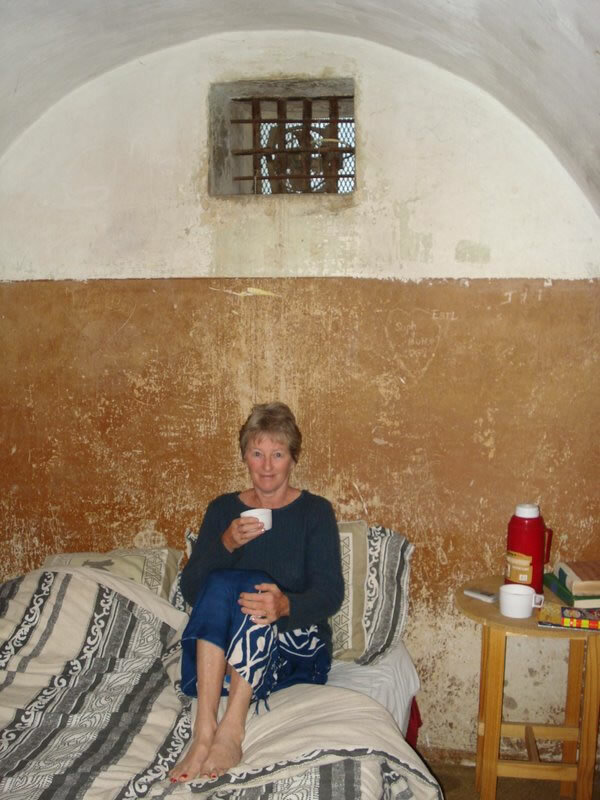 A well deserved stay in Gaol!